Sarah Diamant Florist based in Woodford Green, will work with you to ensure you achieve all your floral requirements and deliver a truly special event. We cater for all your floral needs from Birthdays to Bar Mitzvahs, Christening to Charity events and from the opening of art galleries to corporate and sporting events. Sarah Diamant has built of wealth of experience working for some of the most highly-regarded florists in London and is proud to have made and designed event flowers for the Bulgari Hotel, the Wimbledon LTA Tennis Finals (including the Royal Tea Room and the finalists bouquet), FA Cup Final & NFL at Wembley Stadium, Lord’s Cricket Ground, the Invictus Games, luxury jewellery brands in Harrods, The Gherkin, Caviar House, The Royal Courts of Justice and the Orient Express, to name but a few. To help you choose a floral design, below are a few photos of event flowers from our event flowers gallery. To view more images please contact us to arrange a private consultation or you can visit our Facebook, Instagram and Twitter. The event organiser wanted us to incorporate a purple and white look into this display. 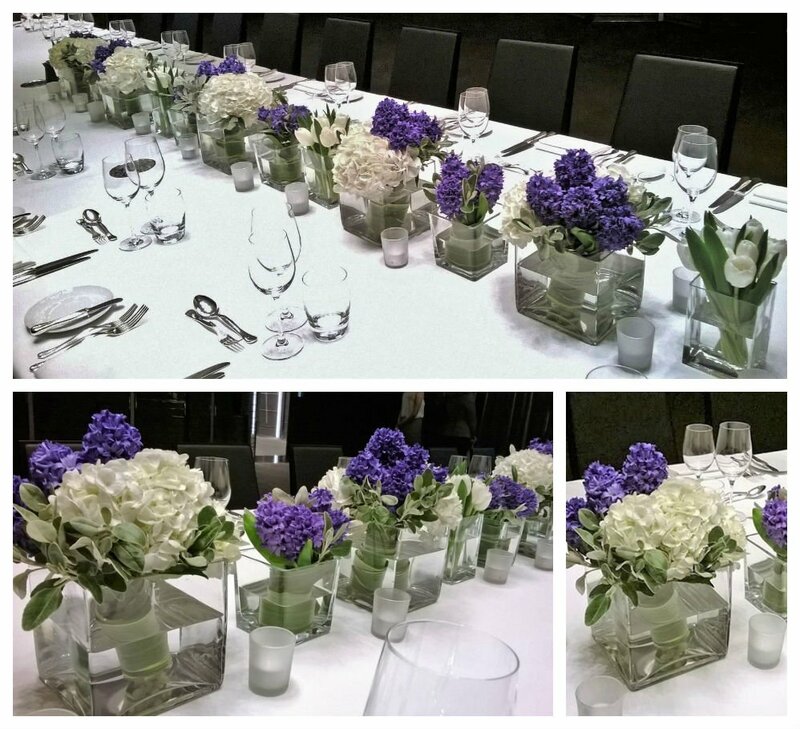 Hyacinthus, Tulips and Hydrangeas were elegantly arranged on a long rectangle table for this dinner event. The cluster of glass vases brings a modern and neat finish look to contrast with the spring feeling from the fresh flowers. Such a lovely table arrangement was made for an indoor event where the idea was to have a garden at home. 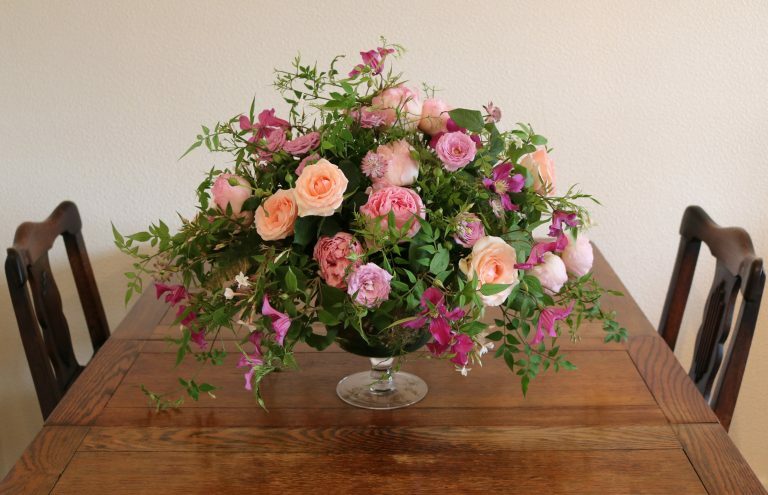 The fabulous scented Garden Roses and their magnificent colours were used with the delicate fuchsia Clematis and mixed with a selection of English Garden foliage. The vibrant floral colours perfectly matched the ambiance of this quirky dinner party. 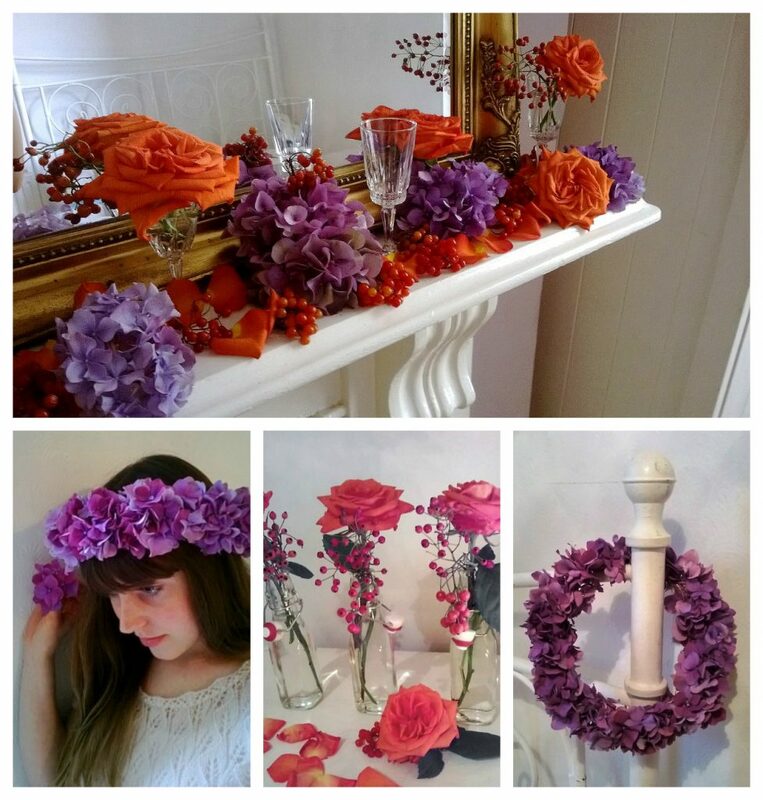 The event took place at the end of September so we could take advantage of the autumn purple Hydrangeas, the gorgeous bright orange Roses and the red Viburnum berries. The flower frame was made for the reception wall of an art gallery in France. The event was to mark the ‘le Vernissage’ of a new lively oil painting collection. The colourful mix of flowers gives a warm and welcoming feeling which greeted the visitors upon their arrival at the event. For enquiries regarding bespoke floral arrangements for event flowers / one off arrangement, contact Sarah Diamant Florist for a personalised consultation by clicking here.